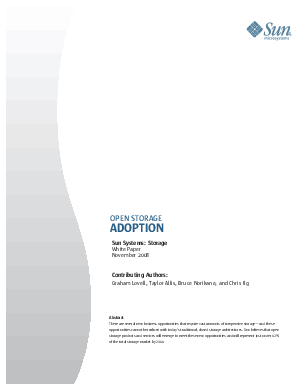 This free white paper reveals how businesses are benefiting from latest generation of open storage systems. Years ago, all servers were closed and proprietary; then open systems hit the market, combining rapid technological innovation with market-driven choice. In the white paper, you'll explore how open architectures are helping some of today's best-known enterprise names stay flexible and profitable. Learn how Web 2.0's massive storage requirements are pushing businesses toward storage that's affordable, reliable, and dynamic; how storage source code that's open to the entire development community gives you faster innovation, wider choice, and lower costs without vendor lock-in; and how to stay eco-responsible by cutting your footprint and power consumption-along with power costs. You'll also see how 6 organizations around the world are succeeding with the latest open storage technology. Download your free copy now-it's your gateway to storage technology that's letting enterprises do much more for less.